DEUTSCHES MUSEUM: The Deutsches Museum imprints itself onto Munich’s landscape like an enormous, crazy scientist with oversized goggles, sitting in a duck-shaped boat he’s trying to launch into space. GRAND: The museum sits on an island in the Isar river. Want to see the bench where the first atom was split? This is where it’s at! Ditto for the first automobile, U-boat and diesel engine. There are rocket planes, a planetarium, ships, satellites and an underground mine. And believe it or not, that’s just for starters. Opened in 1925, this is the world’s largest science and technology museum. 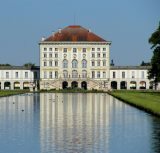 Of Munich’s many museums this is the biggest (55,000 square metres) and most popular (pulls about a million visitors a year). There’s 17,000 objects displayed and they say you’d have to walk about 100kms to see everything. This sounds like fuzzy science to me, but it’s damned big no matter what. Deutsches Museum is a big drawcard. Maybe it’s a guy thing but the aircraft section blows me away the most. The hall is crammed with things that fly and some that probably shouldn’t have. There’s a section of a Lufthansa airliner, a slick F104 Starfighter, a 1930 Junkers cargo plane, World War Two era Messerschmidts and the Third Reich’s wacky attempts to build a manned rocket. It starts on the ground floor, towards the back and then goes up, up, up. “Sorry, but I’m married to the sea.” That’s not just a handy break-up line but also what you may be saying after a visit to the shipping section. Here you’ll find not only models but real, full-sized ships ranging from sailing ships, passenger liners, warships and the first U-Boot German submarine. It's on the ground floor and basement levels. #3 Can ya dig it? It’s mine, it’s all mine! Good times are to be had weaving your way through the underground tunnels of the mining exhibit. 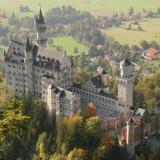 Coal mining propelled Germany into the 20th century and here you can learn how they did it. It starts off explaining the early era of mining and leads up to modern techniques, with truck-sized drilling monsters straight out of a bunny’s nightmare. Go down, way down. Who hasn’t dreamt of soaring space in a silver suit, the Earth a pebble from yesterday and the cosmos at your command? Probably not so many people actually, but that doesn’t mean you won’t enjoy the Planetarium. Lie back inside the dome on top of the museum and be beamed into the galaxy as you’ve never seen it. It’s been shooting people into the abyss since 1960.
lightning in this Faraday Cage. They don’t call it the Power Hall for nothing. Everything to do with electricity is lit up here in brilliant detail. 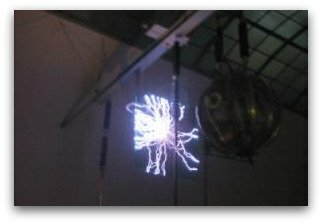 The highlight comes when a museum shock-jock steps inside a globular Faraday Cage, is hoisted into the air and hit with 222,000 volts of lightening. Shocking, simply shocking. It’s on the ground floor, to the right of the shipping section. The Deutsche Museum caters well for juniors. Here, they can hit it, switch it, spin it or crank it, many displays are interactive. There’s also a special section on the basement floor called Kinderreich (Kids’ Empire) that should have them begging you to stay longer. Location: Museuminsel 1. 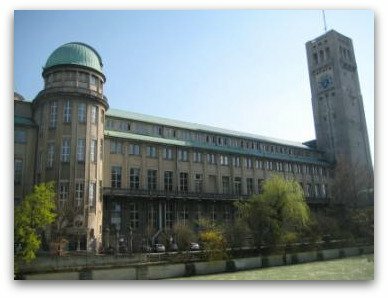 The Deutsches Museum is on an island in the Isar River. Cost: Adults €8.50, children and students €3. Kids under six go in free. 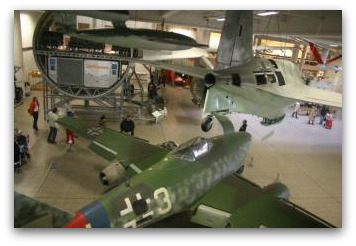 A combination ticket costing 17€ will also get you into a separate vehicle museum and an aircraft museum across town. Directions: Take the S1 or S8 to Isartor. Or take tram 18 and get off at Deutsches Museum. • Valentin-Karlstadt Museum - A museum dedicated to one of Munich's oddest locals. • Isartor - One of Munich's old gateways.